I plan to change the layout if I feel bored to it. I think most of the coven members want to see new things for webpages. And the priority of the featuring character will be based on the poll of the coven members. Idea: This is my first design, and I really love this photo. I think this really makes Lestat looks like a prince. I chose blue and white since few people will use them to illustrate for vampires. The effect of it is good. 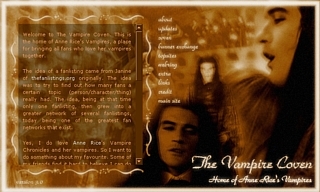 And I also want to put more photos of other vampires in this layout to fit the name of "Home of Anne Rice's Vampires". Sometimes, vampires give us a feeling of loneliness, but they are actually in a family. Idea: Actually I can't really have a good idea for the layout of Louis. Nothing seems perfect to him. But I finally decided to use this blue and white layout again since I think color of blue fits to him. And this photo of Louis really shows his depression and sadness. I love this photo much, so I use this photo to do some coven images also. Idea: This idea came to my mind in one morning when I just woke up (Marius gave me this inspiration?). And I turned on my computer as soon as possible as if I would forget it for a moment later. I like this layout (of course, I like all of the layouts since these are my designs). I think many people will also choose red and yellow to represent Marius. You know, Blood and Gold. Both colors are quite sharp but it still looks good when putting together. Ar, one more point is that, do you notice something in the middle? It is the island Marius lives in the movie of Queen of the Damned. It is difficult to see but I like it. Idea: Originally, I want to use red color to illustrate Armand (since he has auburn hair), or modify the Marius layout for him. However, after testing so many times and effects for the layout, I just think this is perfect for him (at least I think in this way). Armand gives me an elegant impression, so I use some blur effect. And the first thing comes to my mind when thinking of him is Theatre des Vampires. Therefore, I place the theatre in the background. Something golden-like fits him very much. Idea: It is hard to choose from Akasha and Claudia as the featuring character of this layout since they really have got almost the same vote. But after waiting a long moment, Akasha has leaded Claudia a little bit. Akasha gives me a very strong and powerful impression. 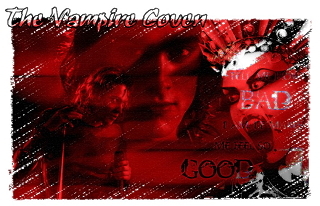 She is the mother of all vampires and Queen of the Damned. The picture with disclosing the fangs makes me think she is difficult to be controlled and she has the thrilling power. And, I have also chosen the picture of the statue from the movie to illustrate her as Those Who Must Be Kept, which finds to be a very important role in the novel, Queen of the Damned. Idea: I have used the cover from the novel of Pandora since I was so impressed when I first saw this book cover. The lady is so beautiful and can hold my breaths. 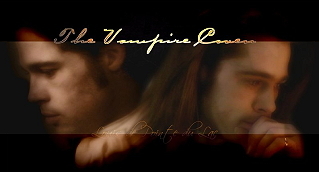 I solely use this image to do this layout since I do not think the movie images for Pandora in Queen of the Damned are attractive. The layout is colorful for the top and bottom but blue in the center part. This is just like the complexity of Pandora's heart. Idea: Since I think it is pity that the old layouts have been wasted everytime when a new one is uploaded, so I change the entire site to use PhpSiteSkin. Then every old layout can be used and chosen by the visitors. Certainly for the first layout, I will use Louis as the featuring character since he is my favorite character. The two images in the layout are my favorite ones. They can show the humanity and struggles of Louis and make you feel heartbroken. Hope you would enjoy this layout. Idea: All my websites have been hacked since Dec 08. So, I would like to have a large scale update of my websites, especially The Dark Heaven, that I have planned to change from html to php a long time ago. But before doing this, I need to change the original layout to fit this code modifcation. And for practising several blending effects, I have this layout done surprisingly. I think this suits here much more than in The Dark Heaven. Therefore I put it here. 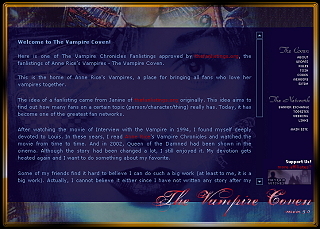 I used the fanarts of Adwbuffy (the Lestat in the movie one) and 0mri (the Akasha illustration one). I choose this just for experiment and the result is quite good. And I want to do something totally different from the Louis layout, which is so elegant while this Queen of the Damned one is so rock and attentive. Hope I can give one more choice for you to choose with. Who will be the next featuring character? it is chosen by you. take part in the poll right now!